The Apple iPhone gave the start to the smartphone revolution nearly six years ago and – who would have believed that? – it became the world’s most used camera. But yeah, the iPhone remains a fairly simple device with an almost fully automatic camera and photo/video lovers are craving more manual control: more settings, more filters, more editing options. The good news is all of that is is allready there! Some of the best camera apps are built for the iPhone! With Instagram – free for iOS and Android) you can use dozens of filters to give a special look to your photos and share them with others easily. You can do this through the Instagram-network or through mail, Facebook, Twitter, Tumblr, Flickr or Foursquare. The app also lets you see photos of other people through the social network of Instagram. If you don’t care about the social features, then Pixlr-o-matic – free for iOS and Android) might be a better solution for you. There are literally hundreds of filters, special effects, borders, etc. for your pleasure. You can even add effects on top of effects, so much that there are at the least five million combinations! Tip: You can apply the filters and effects on the website of Pixlr-o-matic as well. You will need to use a webcam or import photos and after the modification export them again. The free Snapseed-app (for iOS and Android) can be seen as the Photoshop for your smartphone. In the meantime, it has been acquired by Google and offers many possibilities for you. You can automatically adjust your photos (which works great) or even change the contrast, white balance, brightness and more! Furthermore, you can trim, sharpen and add effects like black and white, vintage, center focus or even tilt shift. 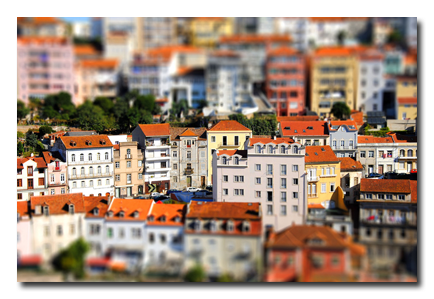 With tilt shift it seems as if your photo is taken in a miniature world (like model buildings). When you have finished you will be able to share your creations on Facebook, Twitter or even Google+. Tip: There’s also a desktop version for Mac or Windows, but it costs $20. (small price to pay if you find it useful, can’t get any better now can it?). Camera+ is my most favorite alternative for the built-in camera app in the iOS with different versions for the iPad and iPhone (each €0,89). The App has many advantages such as: better stability of recordings, improved digital zoom, continuous light instead of flashlight, numerous scene modes to take better photos under certain circumstances. But, most of all, this app is very fast so you can make more photos in a faster pace. You can edit photos and even apply filter-on-filter for unique photo effects. Beware! The only negative point is that transferring your Camera+ photos to a standard roll of film doesn’t go as smooth, but you won’t have to do this every time. You can also share your photos with Twitter, Facebook and Flickr. Tip: If you don’t want to pay, you could try the – almost but not quite as good – alternative Camera Awesome – (for iPhone and iPad). If you have an Android-smartphone then Camera Zoom FX (€1,99) might be the bang for your buck. This too, is a replacement of the standard camera-app with a lot of extras, like a stabilizer, a timer-function and a burst mode to take more photos at a faster pace. You should be able to take about 8 photos per second (depends on the speed of your smartphone). As with the others, this app also has an edit-function and filters which you can apply (try Blue Hawaii or Childhood once more) or dozens of other special effects available for your use. Tip: The voice activated shutter is a very cool feature, the trigger works with your voice or a clap of the hand.